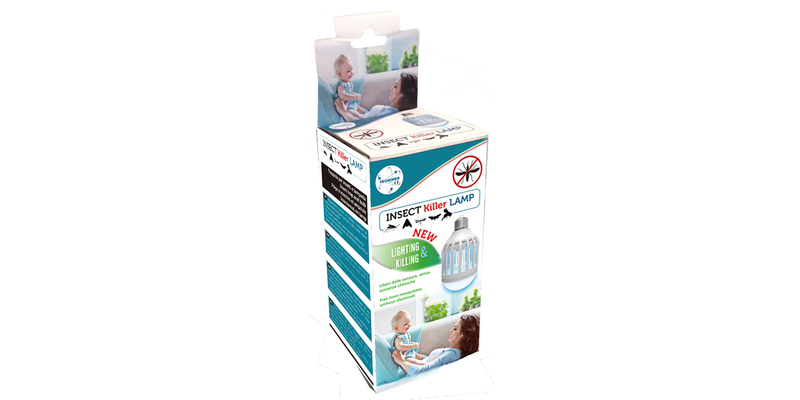 INSECT KILLER LAMP is an ecological device designed to trap mosquitoes (mostly Aedes and Culex kind) and other flying insects. It could be used both indoor and outdoor. 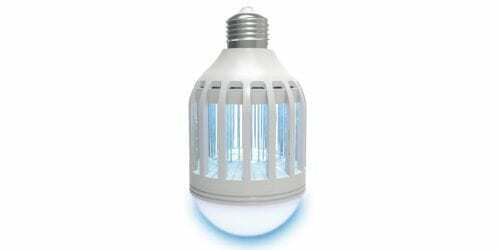 It performs the dual function of electronic trap and LED lamp, but can also be used only as electronic trap both day and night. It is composed of a plastic case that is both the base for the bulb and the external protective grid. Inside there are 4 blue LEDs able to attract mosquitoes and the other insects and a metallic grid that strikes them producing an electric spark which, thanks to its low amperage, is totally safe for humans. It can work in any position, vertically or horizontally. For indoor and outdoor use as long as protected from atmospheric agents. Install the bulb in a E27 light connector (WITHOUT CEILING LIGHT) working with a normal wall switch. 1. Press the switch ON: both lighting and insect killing functions are active. 2. Press the switch ON and press it OFF again right after: the lighting turns off and only the blue LED lights will be on. 3. Press the switch again: the device is completely off. – keep the electronic trap always ON (blue lights) DURING THE DAY as well. In this way it is possible to catch tiger mosquitoes (Aedes Albopictus) which are very aggressive, they bite during the day and are suspected to spread Zika virus. Other insects that fly during the day will be captured as well, as wasps and hornets. – during the night, switch on the bulb together with the trap to fully exploit the potential of the device. 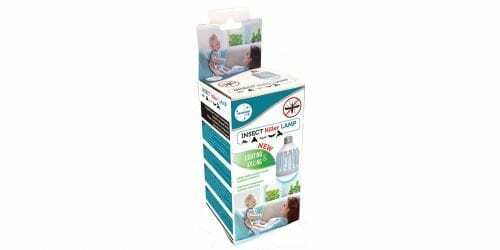 In particular, it works very well against the other mosquitoes as the Aedes Aegypti kind, the main Zika virus vector, and the Culex one (mosquito which is suspected to spread Zika virus too). RECOMMENDED FOR: mosquitoes, wasps, hornets, etc.